BOSTON – October 11, 2018 – Brandon Hall Group recently recognized three Skillsoft and SumTotal Systems customers with Excellence Awards. 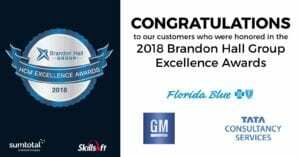 Florida Blue, General Motors and Tata Consultancy Services each received Silver for their innovative learning and talent management programs that enable employee development and influence organizational goals. As a Skillsoft customer for more than 15 years, Florida Blue has continually demonstrated a commitment to solutions that maximize job performance, create efficiencies and extend capabilities in their healthcare community. In 2017, Florida Blue deployed SumTotal Learning Management with Skillsoft’s core learning assets to 20,000 learners across Florida Blue’s employee base, contractors and external agents. Florida Blue also used SumTotal to deliver Medicare certification training in-house for the first time. The Medicare Certification Program saved Florida Blue more than $300,000 in 2017 and is expected to save an additional $900,000 in 2018. Transitioning from GM’s decentralized LMS to Skillsoft’s enterprise-wide learning program has significantly improved the user experience and accessibility of learning content. Designed to meet learning needs across distinct roles and disciplines, including Finance, IT, Project Management and Six Sigma, GM recorded 41,228 course completions across 23 business functions and a total user population of 18,262. This represented a 23 percent adoption against an audience potential of 70,000, in 2016 alone. GM implemented the learning program to automate learning analytics. The program enables GM to manage curriculum and completion with rigorous datasets and industry benchmarks. Utilizing Skillsoft’s Leadership courses, TCS developed a “Leader in You” program (LiY). The program sharpens the critical leadership and management competencies of middle managers, enabling them to lead teams, embrace change and demonstrate customer centricity. TCS aligned the Skillsoft content into three themes – managing your business, managing your teams and managing yourself – to support its business goal of achieving a 100 percent agile-ready workforce by 2020. Additionally, Brandon Hall Group awarded Gold to Skillsoft’s Sales Enablement team for Best Unique or Innovative Leadership Development Program. This Excellence Award recognized the success of Skillsoft’s “Leadership in Focus” program that provided leadership development opportunities to the company’s global sales leaders. The continuous, blended learning program trained 69 sales leaders and 13 high-potential field sales personnel in a five-month period.